Today is National Cheesecake Day! At least according to the Kraft people – who may or may not have a vested interest in such a day. But any excuse for a cheesecake, I say! Especially a no-bake easy to make version. People often think that dessert is the first thing to go for those who are watching carbs, calories or otherwise eating healthy. The old “if it is fun, tasty, or pleasurable then it must be bad for you” theory. Not true. The occasional indulgence in a truly decadent dessert will not hurt if you fill your plate with healthy food the rest of the time. Nor is it true that desserts are to be ignored on a regular basis. Some decadent looking desserts use ingredients that have reduced carbs, calories or whatever else you are watching. Some desserts are healthy on their own and others bring a spark of taste that makes a meal complete. Didn’t know the dessert issue was so complex, did you? Here is a cheesecake dessert that is not complex. Very simple with three ingredients. A blank slate for whatever garnish you choose. Or not. You can put it into a graham cracker crust. Or not. You can see I chose the chocolate garnish, no crust option. I like to divide this cheesecake into ramekins shown because they come with lids and I can save half the dessert for another meal very easily. Dividing it into individual containers also provides automatic portion control. The chocolate garnish is simply a Dove Dark or Hershey’s Dark Bliss shaved with a sharp knife over the top of the cheesecake. 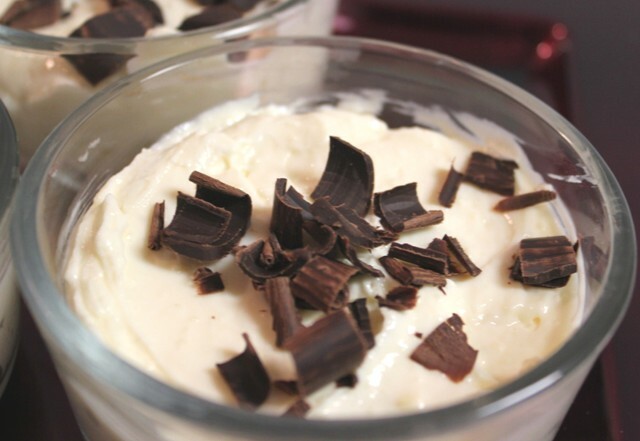 This dessert does need to be made a couple of hours ahead of time, but it is quick and easy. If you’d like another basic cheesecake take a look at this Crockpot Cheesecake.Happy Cheesecake Day! This recipe was featured on Chatty Chics and Petite Hermine. A soft no bake cheesecake when you need just a little something for dessert - fast. Whip cream cheese in medium mixing bowl with mixer until there are no lumps. Add milk, about a quarter cup at a time, and beat until milk is incorporated. Mixture will be liquid. Add pudding and beat until mixture begins to thicken well. Turn into crust or serving container and chill until firm, about two hours. Makes 6 servings. Approximately 9 carbs per serving. This looks great! Im sad I didnt know about national cheesecake day 🙁 I would have celebrated for sure! Ps.. thanks for linking up! Im sharing this on twitter and facebook today! Oh wow! This sounds delish! I’ll be featuring it on Wild Wednesday! Thanks for linking up! Now this is my kind of cheesecake! 🙂 I love how simple this recipe is! I would love for you to share this over at my “Unveil Your Genius” link party! This is such an easy and tasty Cheesecake, a great dessert. Hope you are having a great week end and thank you so much for sharing with Full Plate Thursday. Looks so good. I pinned it. This looks so good! I can’t wait to make it! How awesome, cheesecake is delish and this no bake version is something I would definitely try! Thanks for linking to tea party Tuesday. oh nothing better than a no bake treat! Sounds delicious. I’m definitely going to try this recipe. Thanks for sharing. oh my…i am salivating over this.